Installation, Assembly and Placement in the Exact Spot You Want. To schedule a delivery please call our Distribution Delivery Center, 703-406-7600, press 2 for delivery. Our truck routes are planned one day prior to your delivery. You will be contacted on the day prior to your delivery with a three hour window for the delivery team's estimated arrival to your home. To view this estimated arrival time and track the delivery truck on the day of your delivery please use our Online Delivery Tracker. All merchandise must be paid in full two (2) days prior to delivery. No CODs are accepted. Our distribution center will confirm your delivery date 24 hours prior to delivery - at the time of this call they will provide you with a three-hour window timeframe for your delivery. Please understand that some circumstances beyond our control, such as poor weather conditions and traffic jams, can delay delivery time frames. In these rare cases we will do our best to contact you with an updated delivery timeframe. Please keep in mind that we deliver furniture to hundreds of homes each week. In order to serve all of our customers fairly, we request 48 hours notice to make a change in your delivery appointment. If you cancel a delivery less than 48 hours before its scheduled delivery we will charge a handling fee equal to delivery charge. During inclement weather, Belfort Furniture will determine whether it is safe for our drivers to make deliveries. To review our complete terms and conditions, please contact a salesperson. Please note: Due to insurance limitations, drivers are not allowed to assemble cribs, handle televisions, stereos or other electronic devices, nor can they install mirrors, paintings or other items that require fastening to walls. Furniture may be picked up at our warehouse free of charge. All orders, except for Clearance items from showroom floors, can be picked up at our Distribution Center at 45190 Ocean, Ct., Sterling, Virginia. Please note, this Distribution Center is located about a mile and a half away from our showrooms. Please view our Directions To Our Warehouse For Furniture Pick-Up. Don't forget to measure! 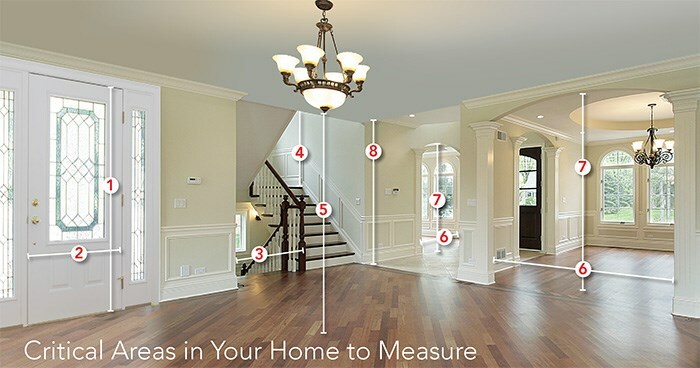 You'll want to measure to make sure your new furniture will fit into your home. If you live outside of our Belfort delivery zone, we offer White Glove Delivery via a long distance carrier. Long distance delivery costs are determined by the weight of all items being delivered. All furniture comes from the manufacturer to our warehouse in Sterling, Virginia and is then picked up by the long distance carrier. Transit to your area from our warehouse will take about 15-20 days from the time the order is picked up from our warehouse. This time is in additional to the special order lead times for product to reach our warehouse from the manufacturer. Long distance deliveries are custom quoted by our Online Sales Team. Please E-mail the Online Sales Team with a list of your items of interest and your delivery address for a custom quote. Have An Issue After Your Delivery To Report?